Kendra Young’s degree was more than 30 years in the earning. Young, the faculty relations manager for Wilfrid Laurier University, has been learning her whole life. But when she crossed the convocation stage at Lazaridis Hall on Laurier’s Waterloo campus on June 12, 2018, it was the first time she left with a university degree. Young, 57, finished high school in British Columbia in 1979. She went on to Langara College in Vancouver and took some courses that earned her first-year university credits but she was “not very applied” as a student at the time, she says. In 1986, a three-months-pregnant Young moved to Kitchener. Ten months after her daughter was born in 1987, she found a part-time job in Transportation Services for the City of Kitchener. However, she wanted to work full time. That was when she saw an ad in The Record recruiting temporary staff at Laurier. Young applied for a temporary position but ended up getting a full-time, permanent job as a secretary/receptionist in the Office of the President. She found Laurier a great place to work and saw opportunities for advancement, so she asked her then-boss, Doug Witmer, what she could do to secure future employment opportunities and build a career within the university. “You need to get your degree,” Witmer said. Following his advice, Young started to take courses. She didn’t know what she wanted to do, but she wanted to improve her writing, so she took courses in Communication Studies, Business and English. Young earned a diploma in Business Administration in 1999, a credential that required fewer credits than a degree. However, she found she missed learning, so she decided to pursue a full degree. Meanwhile, Young’s career flourished. 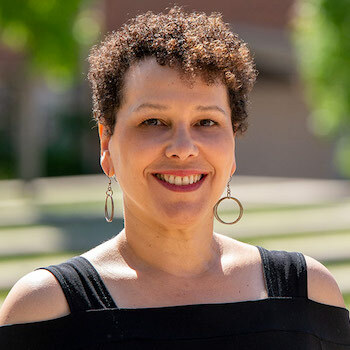 Among other positions, she was secretary to Dean of Students Fred Nichols, executive secretary to the vice-president: finance, executive assistant to the dean of Arts, executive assistant to the dean of Science, and manager of faculty relations in the Office of the Vice-President: Academic. She has been in her current managerial position since 2009. It hasn’t always been easy to combine her career and studies. She has taken breaks at times to focus on work and her personal life. However, Young says her studies themselves haven’t been excessively difficult. Three years ago, when Young was cleaning out her basement, she found her Business Administration diploma and decided to hang it in her office along with certifications from the Rotman School of Management Advanced Program in Human Resources Management and the Schulich School of Business Leading With Emotional Intelligence program. She purposely left a fourth space as a reminder of her goal to finish her degree. Young had been planning to graduate with an honours degree in Communication Studies but she decided she wanted to fill the space sooner, before she turned 60. So once she had earned the credits she needed for a general degree, she applied to graduate. Her daughter, son-in-law, and partner, Steve Shaver (BA ‘83, Diploma ‘83), were present to proudly watch her cross the stage. However, Young isn't done with her studies now that she's removed her cap and gown. She’d still like to get that honours degree. And after that? Maybe a master’s, likely in Communication Studies, she says.